Or? How is your phone voice? 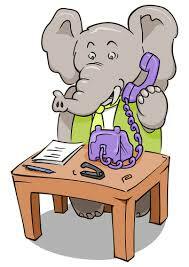 I hope you will forgive the opening play on words taken from an amusing poem by Laura Richards, but I wanted to illustrate that, just like an elephant, a listener will never forget the sound of your voice on the phone. During a phone call your voice, or the voices of your staff, become the representation of you and your business. That is why it is essential that you give this some consideration. Over the years I have delivered a number of bespoke workshops for businesses where a lot of the selling and first contact were done on phones. (In fact, I have another one in autumn 2015 which prompted this article). So what does science tell us about communication via the telephone? In the first few seconds of a call, the listener will make subconscious decisions about you. To make those decisions positive, you must make the experience a pleasant one. Slow down and open your mouth to aid clarity and understanding. If you have a strong accent, make sure you give extra time and really make a physical effort to speak clearly. Have a smile on your face if you want to sound friendly and approachable. Don’t do anything else (i.e. checking emails etc.) while you are speaking. People can hear when you are not concentrating fully. Remember that the SOUND of your voice is having a greater effect on the listener than the words so give more thought to the quality you are producing. If you have to use a script, try to sound spontaneous and interested to avoid ‘switching off’ the listener’s attention. To be heard, you need to be loud enough. If you have a naturally quiet voice, you will need more breath to increase your volume. Try not to push the voice from the throat as this will make it sound tight and you will quickly feel tired. Clarity matters here too. Try not to rush the delivery. In this situation there is a stronger need to ‘get the words out’. This can cause you to sound out of control. When you don’t feel you are being listened too, the tone can become tense and the pitch will rise. Use the breath to steady your vocal notes. If the call is multi-national, remember that it takes time to ‘tune in’ to each accent. You MUST allow time for others to understand or you will be wasting your time and effort. What makes phone calls so dependent on vocal quality, of course, is the fact that the FACE cannot be seen and we need to see expressions to sense the feelings of the speaker. If you can make YOUR VOICE fulfill all these requirements you are likely to be more successful in your communication. 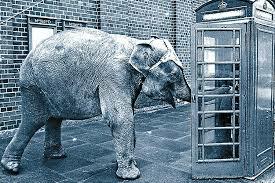 So, make sure that, just like an ELEPHANT your business is never forgotten – but make sure it’s for the right reasons.